My name is Jim Gigandet and I go by Jimmy G. I live in Woodburn, OR and I'm retired. I've been smoking for over 50 years. I smoked 5 packs a day and when I went to Vegas to have fun, I smoked a carton a day. I would even smoke in the middle of the night. I woke up about every 2 hours and would smoke 3 or 4 cigarettes, that's almost a pack just in the middle of the night. I smoked with everything I did. If I couldn't smoke while doing it, I didn't do it. I even smoked while in the shower. I would lean my head out and take a puff every few minutes or so. I can't actually say there was anything that I didn't like about smoking. I loved it and I enjoyed every cigarette that I ever smoked, there were even times when I was smoking 2 or 3 cigarettes at a time. I didn't however like the fact that I couldn't stop smoking. To be completely honest, it pissed me off. It was frustrating that there was something else that controlled my life besides me. I probably tried quitting at least 200 times in my life. My doctor told me about 4 years ago he couldn't believe I was living. I tried everything to quit smoking. I've done the patches, at one point I had 5 patches on and the directions said that if you had on more than one you'd end up with a heart attack and I was smoking even when I had the patches on. I have personally tried every program to quit. I tried Chantix and was almost able to give them up because it allows you to smoke a few cigarettes in the beginning while doing the program, but I would think about smoking all the time. I tried to quit using Nicatrol which comes with this cartridge that carries nicotine in it which I call my "binky". I almost always had it in my mouth and I was addicted to it just like I was addicted to cigarettes. My wife hated how I would act when I tried to quit smoking. She said I would be very grumpy so I would start smoking again, to please her of course. I called Positive Changes after I saw an ad in the paper. I had just had a heart attack that my doctor said was due to smoking. He felt horrible for not thinking of putting me on heart medication prior to my heart attack because it is not uncommon for heavy smokers to have heart problems. I'm a believer in positive thinking and this program is absolutely fantastic. I tried hypnosis 40 years ago and ended up quitting for about 4 months but I didn't have any reinforcements. They were all about the negative; your hair stinks, it's not good for you, etc. At Positive Changes, they are all about the positive. I think it's so positive. I recommend this program to everyone. I haven't had a cigarette since my first hypnosis session at Positive Changes. This program made it easy to quit. The key to everything is to listen to your sessions, you're wasting your time if you just come in, go to sleep and don't listen to them. I'm retired so sometimes I would listen to them up to 5 times a day. I honestly believe that I am a non-smoker for life. I didn't really have any urges or cravings because I don't think about smoking. That's the difference between Positive Changes and other programs. You just don't think about smoking and if you do, you just take 3 deep breaths and it goes away. Even being around smokers doesn't tempt me. I love to play poker and being in the casino is easy. I think the smoke stinks now which is funny because I never noticed it before. I have no idea of how to spend my time now. I used to spend so much time smoking. I play more golf and I'm on the computer a lot. I like to play on line poker, for no money of course. I also sleep a lot more now than I ever did. I haven't gained any weight this time like I did in the past when I would try to quit smoking. My doctor is so pleased. He never thought I would quit. He said I was too hyper and in the past when I would try, my blood pressure would shoot up so high because I was anxious. 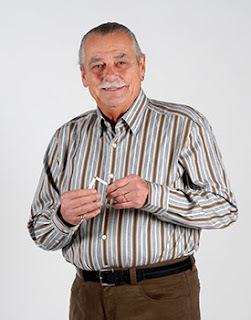 Even having emphysema didn't stop me from smoking. Now that is not getting any worse and my horrible smoker's cough is almost gone. If you come into the program, and I highly, highly recommend you come in, listen to your sessions and I guarantee it does work. I come in here and see all these people from different walks of life here for all different reasons. I don't know who they are but it's working for them too. The cost of the program is a small amount of money if you think about how much I've spent on cigarettes. It's really a great thing for everybody. My wife is happier. She didn't like the smell even though I smoked outside. Now that she's happier, it makes me happier. I just highly recommend Positive Changes and that's all I have to say.